"This door swung open when I least expected it," Lester Holt said Monday, on his first official day as the anchor of the "NBC Nightly News." Holt said in an interview with CNNMoney that he spoke last week with the anchor he is replacing, Brian Williams, and that he wishes Williams "nothing but the best." Holt has been a frequent fill-in for Williams for the past decade, and he officially became the primary back-up two years ago. He's had practically every job at NBC News, from handling breaking news on MSNBC to hosting "Weekend Today" and the weekend "Nightly News" to reporting from hot spots around the world. Every job -- except the most prestigious one of them all, the weekday "Nightly News" position. "This is not the way you want to get a job," he acknowledged in the telephone interview on Monday, one of the first he has given since February. Holt stepped in when Williams was suspended back in February, and last week NBC said he would be permanently staying put. He was on vacation when the announcement was made, so Monday marks his reintroduction of sorts. "The organization is due a moment to celebrate" and take a collective deep breath, Holt said, even though he said he's not "super-comfortable" with all the attention. Even the positive press about him, he said, has "not been fun to read" amid the uncertainty about Williams' fate. Asked whether he agreed with NBC's decision, to bring Williams back to the network family, but not to the "Nightly News" chair, Holt said "That's something I don't want to engage in." NBC's bosses were privy to the internal investigation about Williams, but "I've seen none of it," Holt said, so he didn't want to express a judgment. Holt said he had traded emails with Williams during the anchorman's suspension, but the two men hadn't spoken by phone until last Thursday, the day NBC announced the succession plan. "We had a really good conversation," Holt said. "Both of us quickly acknowledged that this has been an awkward few months, that neither of us ever wanted, but that nothing has come between us, and that we remain friends." NBC says that when Williams' suspension ends in August, he will anchor breaking news and special events coverage, mostly for the cable news channel MSNBC. Williams signed up for another five years on the "Nightly News" just two months before the suspension for storytelling exaggerations. Partly because of that long-term contract, Holt said he had not been harboring any recent ambition to become the network's top anchor. "Look," he said, "those seats don't open up very often." But he revealed in the interview that he had been talking to his bosses "about eventually coming off weekends," after nearly 12 years co-hosting "Weekend Today." "I hadn't quite figured out what that meant, in terms of what I would do," he said, emphasizing that he wanted to stay with NBC full-time, but maybe regain his Saturdays and Sundays. And then the Williams crisis happened. "I knew it was out of my control," he said, "and a lot of it was none of my business." 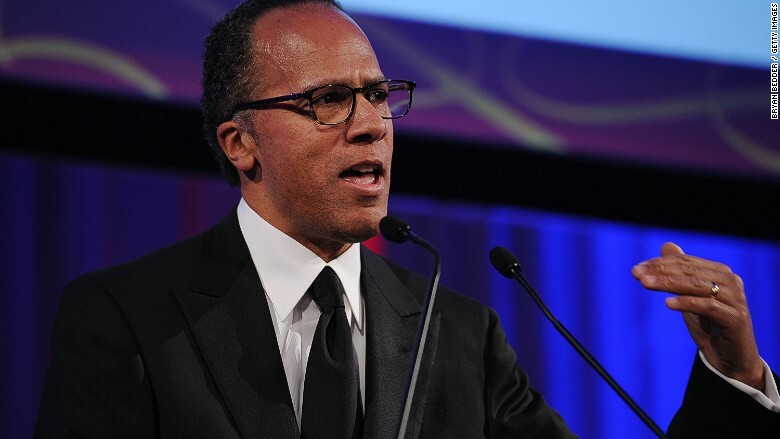 Meanwhile, working with the "NBC Nightly News" staff, "we kept pushing the broadcast forward," he said, expressing gratitude that the staffers embraced him. While the Williams controversy remains the subject of news coverage and speculation, "my focus," he said, "has got to be right now on this broadcast, moving it forward, making it fit my skill strengths."